Well, fellow quilters, sewists, wearable artists, and others, here I sit, your Alchemist Emeritus, trying to decide what to say in my final post. You’ve heard about my plans for online classes, and you know you can keep up with me through my “Color Connection” newsletter. So I thought I’d talk about pattern in fabric. A student in a recent workshop said as she was leaving, “I learned as much about pattern as color today.” Great point. It’s hard to separate the two—they just go together. 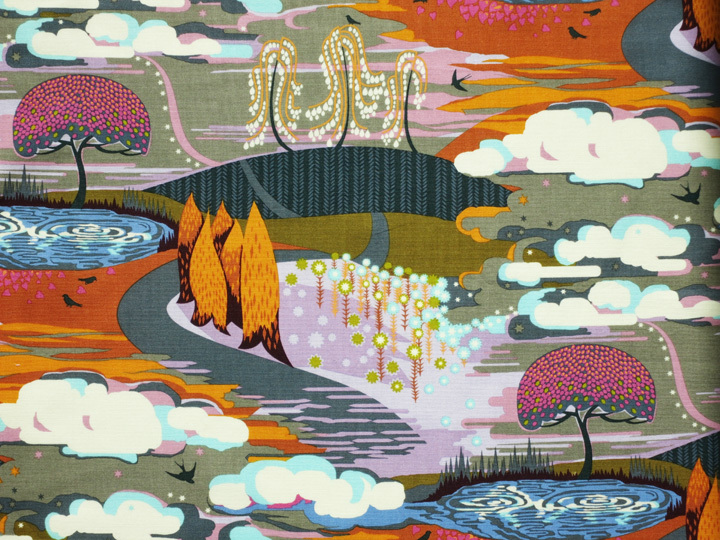 Patterns are described by their style (naturalistic, stylized, abstract, geometric, ditzy, etc. ), their scale (large, medium, small, and everything in between), and their density (open or closely spaced motifs). Classic design tells us to “vary the style and scale” of patterns in a design, such as a quilt, but when I mentioned this in a class early in my teaching career, one of the students tentatively raised her hand and said, “I have no idea what you mean by that.” I got the point and stuck with examples because visuals are almost always better than words, right? Right! So let me show you pattern combinations in a few of my blocks and those of my students. 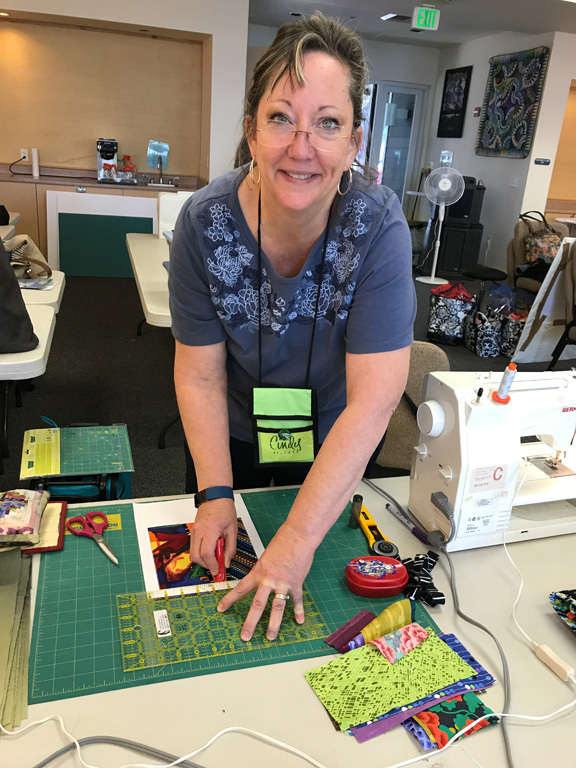 In October I taught my “Urban Sunsets” quilt workshop for the Diablo Valley Quilters (what a great group!). Here are two blocks, one from my quilt, the other made after the quilt was finished. In the first example, the hand-painted fabric on the left is very open, the stripe is geometric and dense, and the Marica Derse print is stylized. (As an example, the paisley motif, which originated in India, is a stylized version of a pine cone.) In the block below, the scale of the hand-dye and the batik is very different, while the “pattern” of the red-orange Grunge is more like a texture. Back to the class . . . . In the delightful example below, you see a near-solid blue, a casual batik plaid, and a stylized floral. There’s a color connection among the fabrics, but the style, scale, and density are very different. Black-and-white strips help to separate the fabrics. What fun to see the repetition of dots in different sizes and colors. (This student was experimenting with the width of the skinny strips. I like to cut mine 3/4″ wide so they finish to a scant 1/4″.) I couldn’t resist: Nancy, who once belonged to the Grass Valley guild, is technicolor 24/7. She definitely brightened my day. Pressing the seams flat is essential to getting a crisp block. Don’t the center units look great up on the design wall? Yellow-green Grunge dots were popular that day. 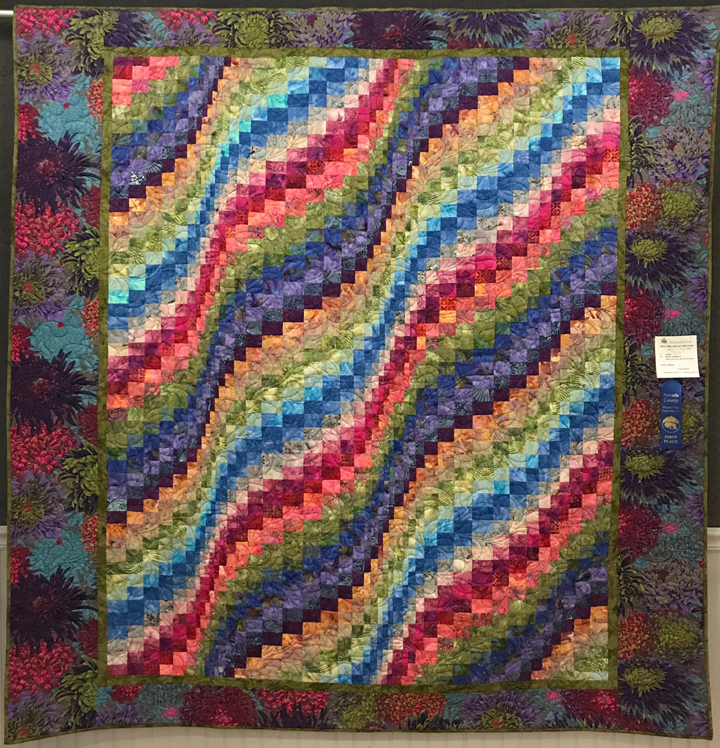 A lovely block, with related colors and very different patterns. The variation in the scale of the prints is very sophisticated. A Grunge in the center ties the fabrics together. 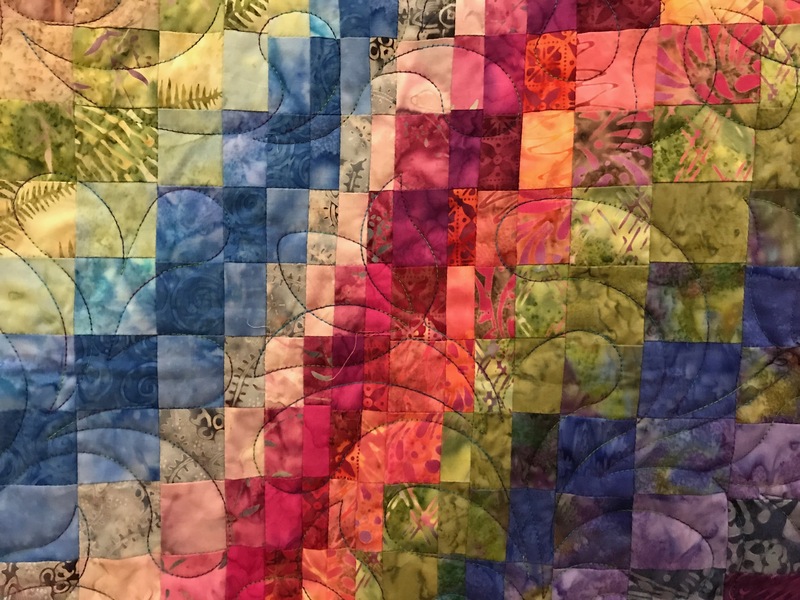 Next stop, the Sacramento chapter of the Modern Quilt Guild, a very enthusiastic group of risk-takers. 🙂 The goal in this Granny block exercise was to work with a classic color combination. 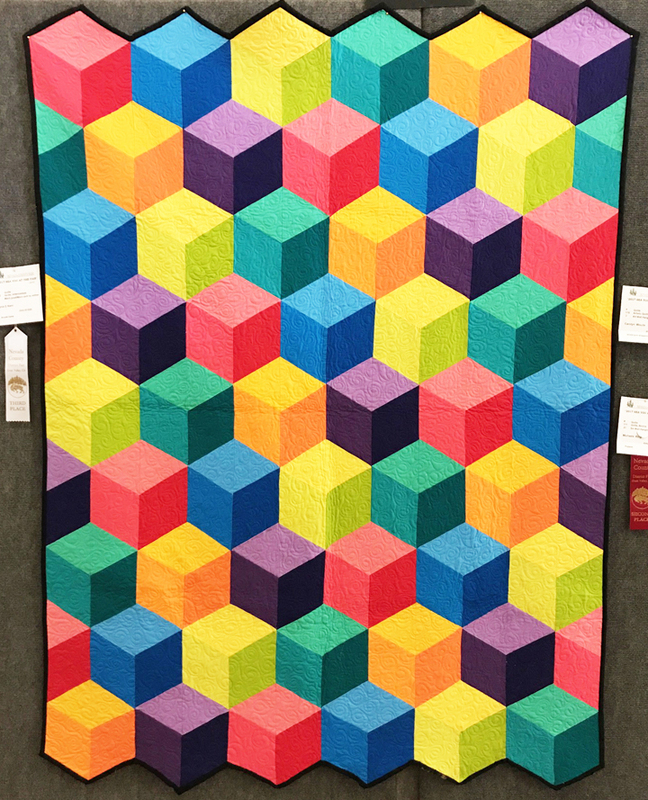 This block is a triad of red-orange, yellow-green, and blue-violet, three colors spaced equally around the color wheel. The patterns are busy, but the colors and values vary enough to keep the design sharp. This block is roughly the same color combination, but two of the fabrics are much less intense than the yellow-green. And wow, aren’t these patterns dynamic together? I especially like the way this student oriented the “striped” fabrics to draw the eye inward. Extra credit for this mock-block! (Not everyone filled in with background triangles on their mock blocks. We were having too much fun, with too little time.) 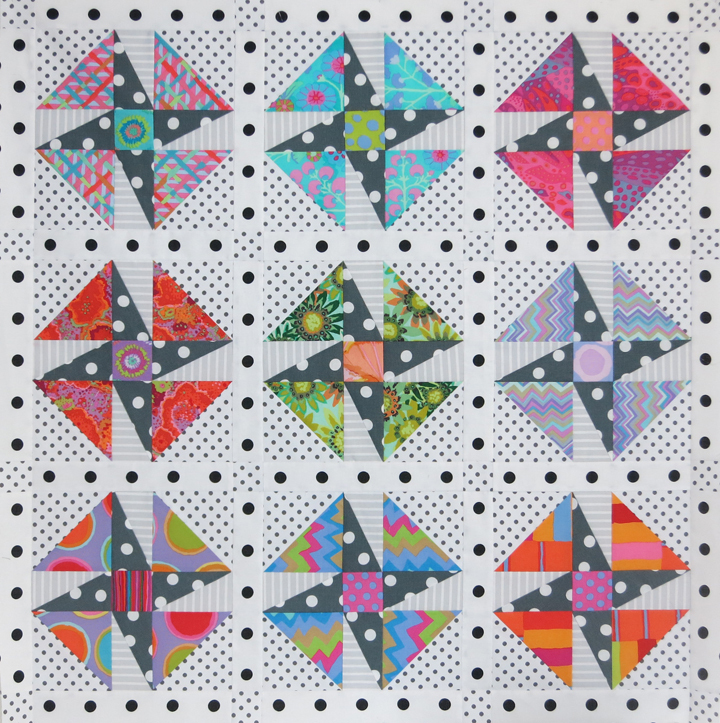 The Farmer’s Wife block, also known as Genny and Ruth, is a wonderful template for working with value, color, and pattern. Search Pinterest and you’ll see many versions—it’s such a versatile design. Here, black-and-white squares really bring the corners forward. Again, not everyone completed the background. Oh gosh, look what happens when the “star points” are white and part of the negative space is patterned—hard to believe it’s the same block as the previous one. I love the fresh colors and patterns in this block. Notice that the triangles are two different colors (yellow-green and blue). Great use of the airy, open print in the nine-patch unit, and the black-and-white print is the perfect scale for the corner squares. Nice! Finally, look what happens when the triangles in a “Japanese X and +” block are highly patterned and darker in value. This student gets even more extra credit for unique pattern placement—this block is going in circles, in a good way. In case I’ve left you confused, this is what a typical X and + block looks like, with the triangles as background. I hope those blocks inspire you to look at and work with color and pattern in new ways. A big thank you to my brave and cheerful and willing students! 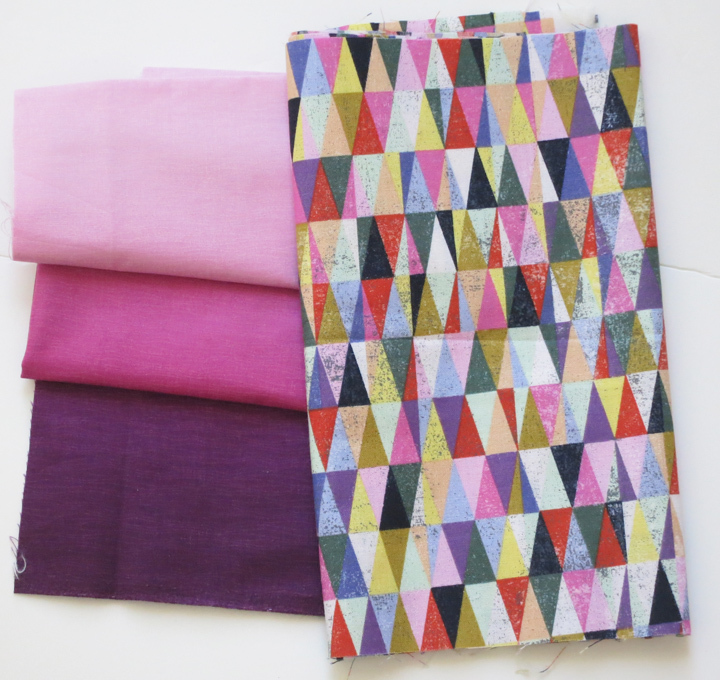 Let’s move on to my Studio Sale and the fabrics I love, but may never get around to using. Here’s how it works: Email me through the “Bio/Contact Me” page on my website, www.christinebarnes.com, not through our AA blog, and let me know what you want. I’ll add the sales tax and postage and get back to you with the total. If it’s agreeable, I’ll send you a Request for Money through Pay Pal. (You don’t need a PayPal account for this transaction.) Once you pay, I’ll send your package. You can also pay by check (I’ll give you my mailing address once we’ve agreed on the sale). OK, here goes . . . So as I end my role as an “active Alchemist,” let me say that it’s been a delight spending time with you. I’ll be following the blog along with all of you, enjoying every bit of creativity and inspiration that Heidi, Mary, Sandra, and Jane share. Yay, AA! First up, a big welcome to all our new followers—we are delighted that you’ve joined us! If you aren’t familiar with our Artistic Alchemy blog, we take turns writing about our latest work, our sources of inspiration, and our creative processes. It’s fun for us, and we love seeing your comments in our Inbox. It’s my turn this week, so without further ado . . . I have a confession: for years, yes years, I’ve been guarding my collection of Elin Noble hand dyes. From what? From whom? Really, it’s ridiculous! But when you look at these photos (the camera is for scale), I think you’ll agree that they are magical, precious fabrics, to be cut only for special projects. They remind me of a mirage, a color mirage. In truth, I’ve used some of these gorgeous fabrics over the years, but I’ve never combined them with solids and—drum roll please—stripes or plaids. It was past time. I began by isolating an area in one fabric with my 6-inch ruler, then marking the area, which was slightly larger than needed, with chalk. For each block, I played with three solids and one stripe or plaid that had color connections to the hand dye, but didn’t necessarily match. The Kaffe Fassett stripe in the mock-up below was too dark, but I liked the idea of a skinny B&W strip as an accent. For my second try, I went with a slightly darker orange, and another wonderful Kaffe stripe. I liked the combination, but I wanted to save the stripe for another group of fabrics. Enter an ikat plaid, along with a rich yellow-orange in place of the dark orange above, and a darker yellow-green Grunge. Now there were variations in values and textures, plus a few bonus colors in the plaid. Done! This block needed a bit more punch and a skinny strip. Replacing the light blue-violet strip with a slightly darker version made the difference. (it’s hard to see this in the photos; trust me). Here’s the block sewn. Earlier I made two blocks with Peppered Cotton solids and buffalo plaids. 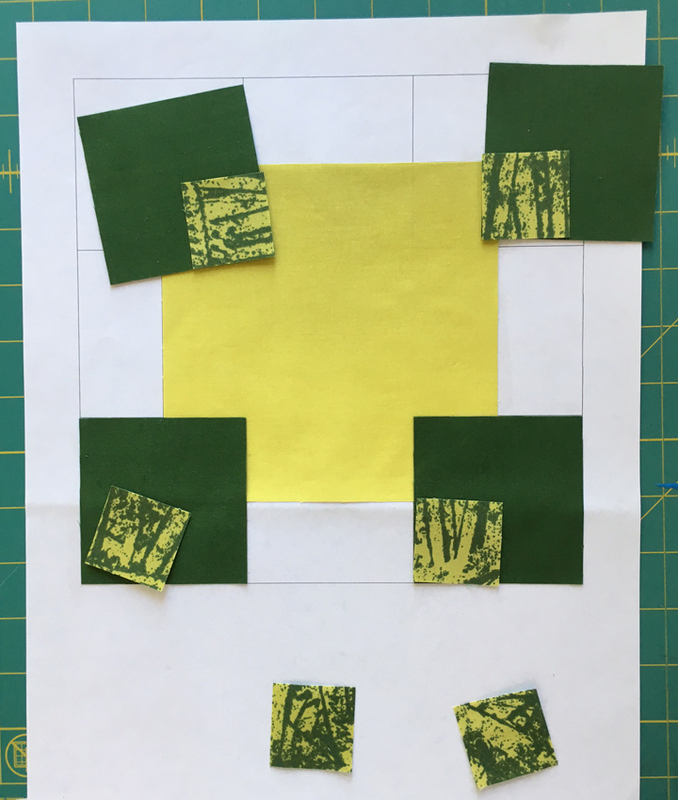 In the block below I see layered transparency where the light area of the plaid touches the center square and the yellow-green strip. The light blue-green strip on the right is an Oakshott cotton from the UK, another magical fabric. I will probably unsew this block and insert a skinny strip. This is just a raw strip laid on top of the block. I enjoyed the mess . . .
And the cut ingredients made for a colorful image. I’m excited about making four more blocks, and of course I’ll show you the finished top. Thanks for following along with my audition-and-edit process. Finally, the four of us are set to launch an ongoing “Studio Sale,” where we offer things we’ve created, fabric we love (but may never get around to using), and other treasures. Because of deadlines and teaching schedules, our first Studio Sale will happen soon, just not today. My apologies to those of you who tuned in to see what we have. It will be worth the wait, I guarantee! 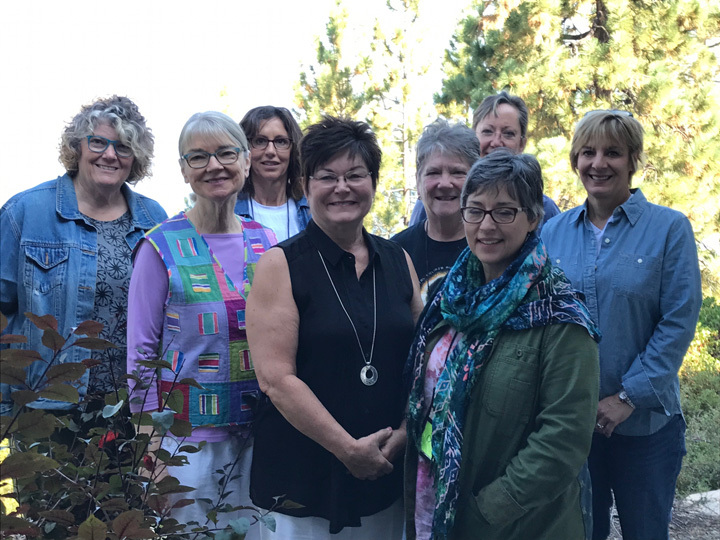 Retreat 2017 is now history, and what a great week it was. Let me begin with my intrepid, up-for-anything students—you were wonderful, one of the best classes I’ve ever had, and your blocks and projects prove it. You were fun and brave and always cheerful. Allow me to show off your work! 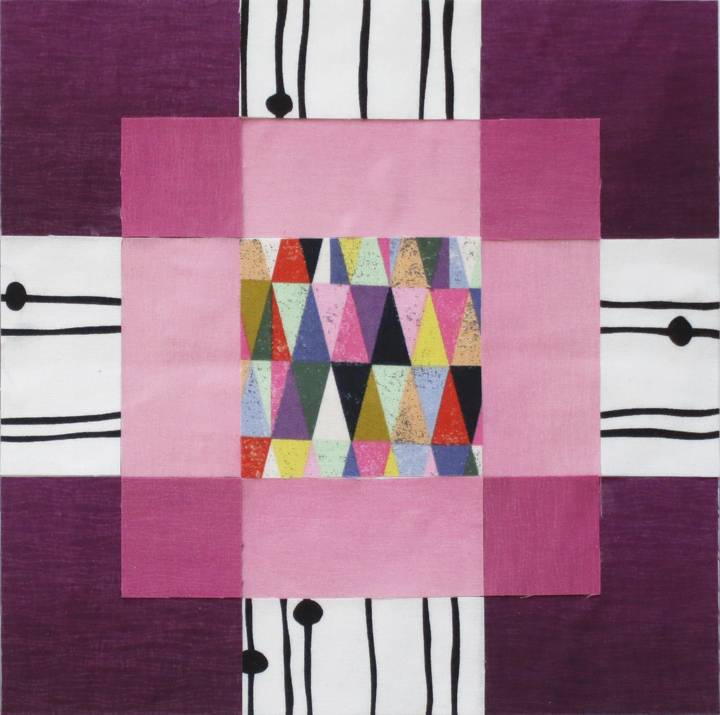 We began with four mock-block exercises that illustrate the adage that “Value does all of the work, and color gets all of the credit.” Contrasts in value create two important effects in quilt design: 1) they add a sense of depth (dark shapes seem closer, lighter shapes farther away) and 2) they establish the design (a dark star shows up on a light background). When the values (lights, mediums, and darks) are somewhat similar, differences in pattern and color can differentiate the shapes, as in these Boy’s Nonsense mock-blocks. Paula combined two very different patterns to establish the design. 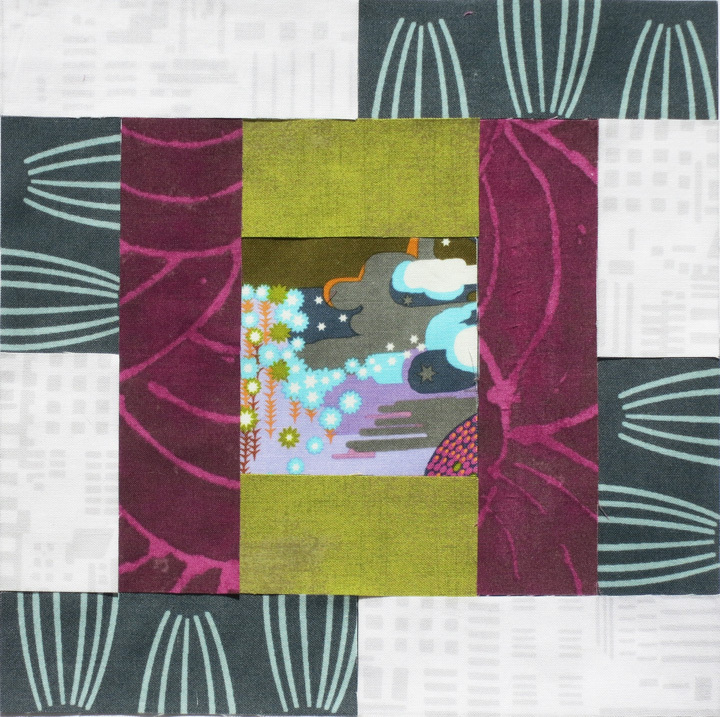 Barb’s modern background fabric makes her block light and lively. 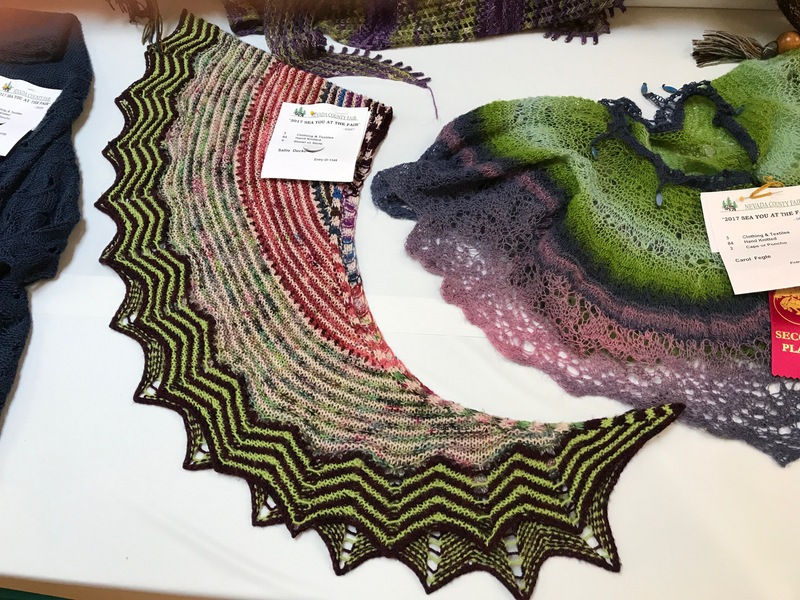 Marti’s intense center square contrasts with the somewhat duller ombré rectangles. The Granny Square block is a great format for playing with light, medium, and dark values. In Lisa’s block, there’s even “accidental transparency.” The way in which Patti used the linear prints is smashing. (I want this block. 🙂 Gale had an assist from her sister Mukhya in pasting up her Best Friends block. A bright print for the outer triangles makes the design even bolder. See how well the dark skinny triangles stand out against the red-orange half-square triangles. 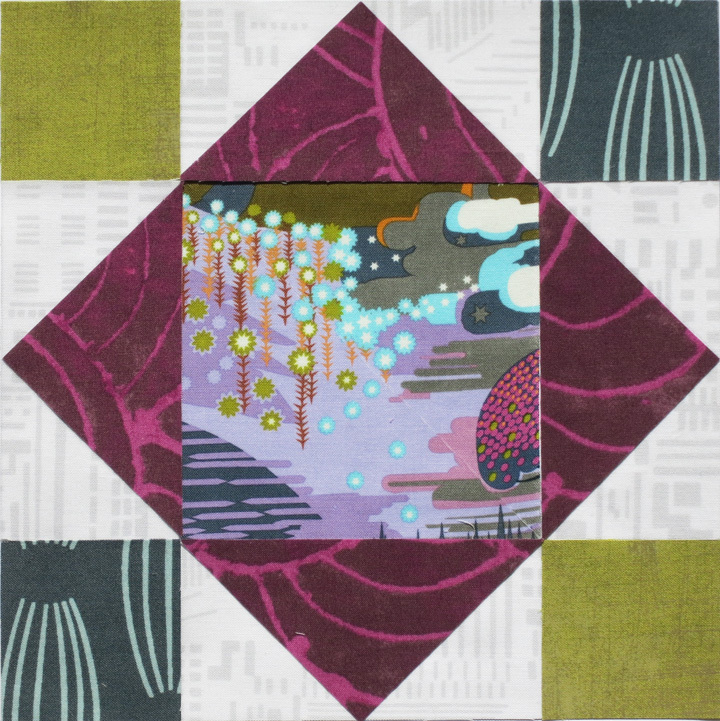 A busy Alice in Wonderland print separates nicely from the background and the dark skinny triangles in Susan’s block. An op-art, black-and-white print gives Gail’s block movement. I’m loving the vintage/modern vibe here, with contemporary fabrics and a Featherweight machine. Yes! Color therapy! Gail auditions fabrics for Laurie’s Spumoni blocks. That’s Susan behind her Urban Sunsets quilt top. It’s difficult to see in this shot, but the black-and-white swizzle sticks have an undulating design (check out the upper right block). 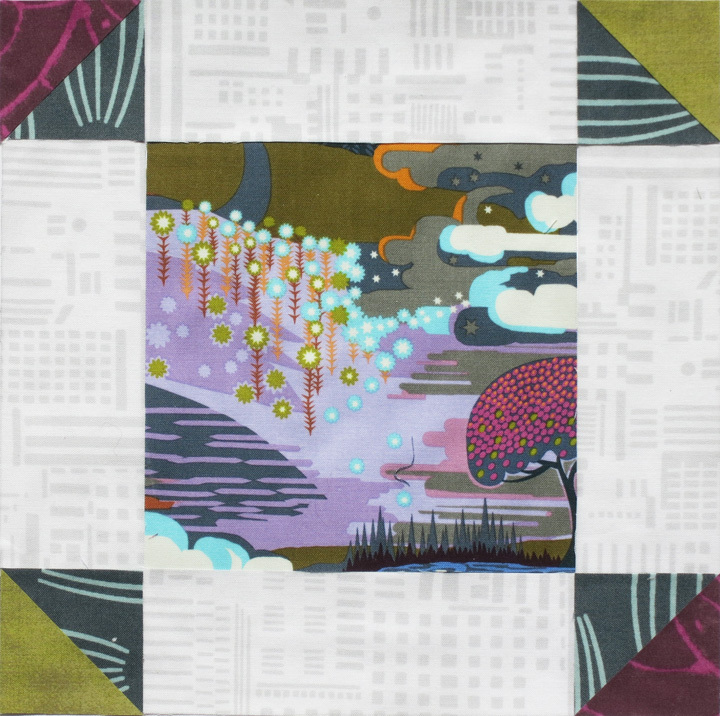 Jane’s Urban Sunsets units are wonderfully different in value, color, and pattern. Variations in value, color, and pattern make for an elegant, minimal design. Lisa’s block, I believe. Cindy working on her Urban Sunsets blocks. Another one of Cindy’s blocks in progress. She’s bordering her center units with a green Gelato ombré instead of the gray. (I can’t wait to show you the finished quilt!) Gail went to town with Kaffe fabrics for Spumoni. See how the different values affect the look of each block. Isn’t our class wall colorful??? There was even more to see, on moveable design boards. These Farmer’s Wife blocks, done the morning of the last full day, really show the growth in everyone’s work. Well done, ladies! Green Grunge triangles flank the nine-patch unit in Ellen’s block. Dark-value corner squares advance and give the design a strong sense of dimension. Though there is some blending in the nine-patch unit, I’m loving the colors and prints in Gale’s version. I’m a small-town girl from Loomis, CA, who grew up in the 1950s in an idyllic setting that included a barn, a pond, an orchard, a garden, a few cattle, and one very naughty pony. My father was a high school history and anthropology teacher who also saw himself as a gentleman farmer, and in the summer I would complain at dinner, “Not potatoes, asparagus, tomatoes, and corn from the garden again.” Then there would be our own peaches on vanilla ice cream. If only I had realized how lucky I was. I do now. So when I migrated from the Bay Area to Grass Valley in 1983, I felt right at home. I even have roots here—my great-grandfather worked in the Empire Mine before the turn of the century, when Grass Valley was a prominent mining town in the California Gold Country. Things have changed, to put it mildly, and it feels as though this charming town has grown exponentially. 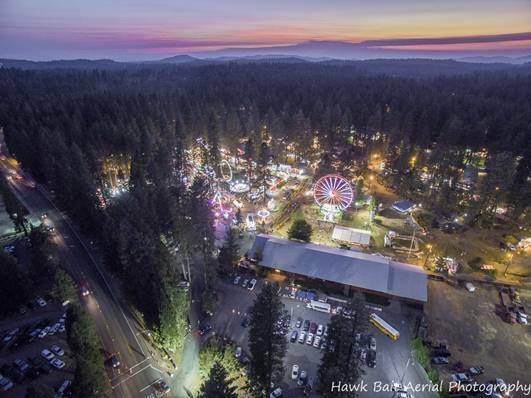 The Nevada County fair has changed too, becoming more crowded as the years go by, though it retains its small-town flavor with events like a pygmy goat obstacle course (darn, I missed that one), gold panning, a ukulele orchestra, and, of course, adorable bunnies, squeaky-clean pigs, and majestic horses. It’s often hot and usually dusty, but the fair is a much-loved part of our county’s culture. At night, from the air, it’s magical. There are plenty of other events, too. The Draft Horse Classic happens every September and is considered the premier show of its kind in the western U.S. 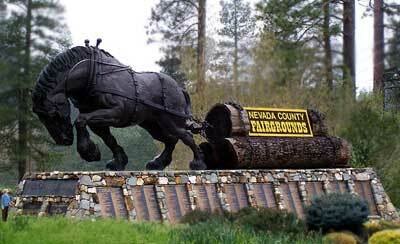 I love these “gentle giants,” probably because my other great-grandfather used a draft horse in his apple orchard in central Washington. 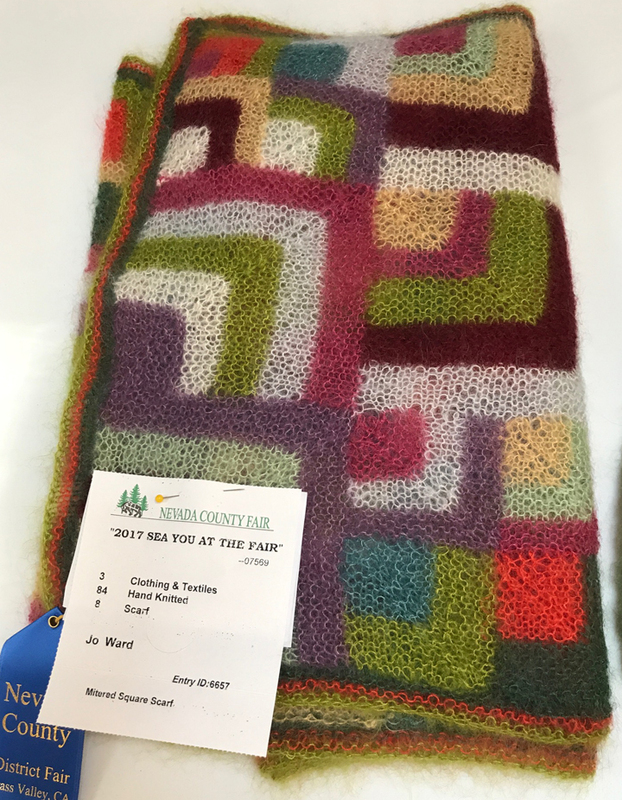 I worked the fair yesterday in the Methodist Church bratwurst booth (if you like brat with kraut, it’s the best), then made my way to the quilts and other needlework. I thought you’d enjoy seeing some of my favorites. I’m stuck in the advanced-beginner category of knitters, and I’m in awe of what’s possible with yarn, knowing that I’ll never be able to knit this well. I watched Lindsey Cleveland start this project at a knitting retreat last winter. 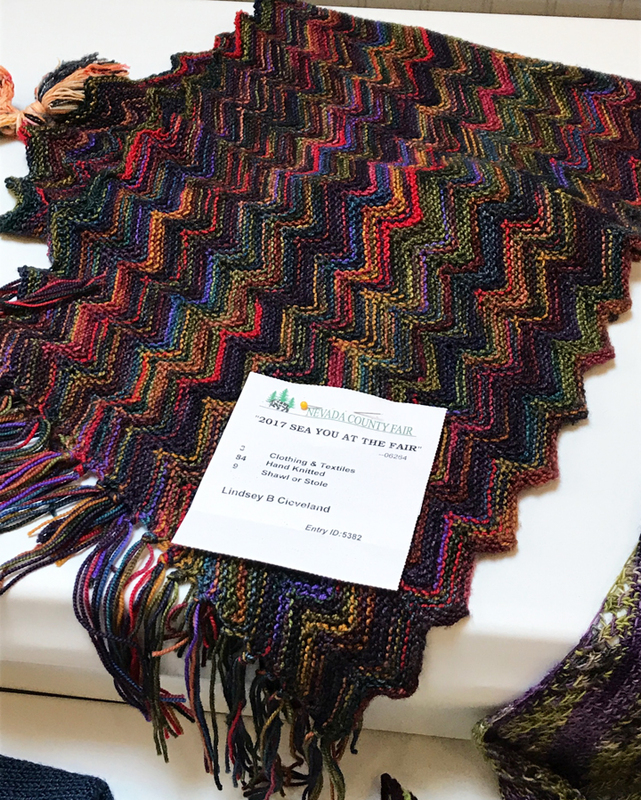 The dark values and intense colors make for a stunning chevron shawl. I love crescent shawls for their graceful shapes, and this one is exquisite! Another beauty, with lovely lacework. 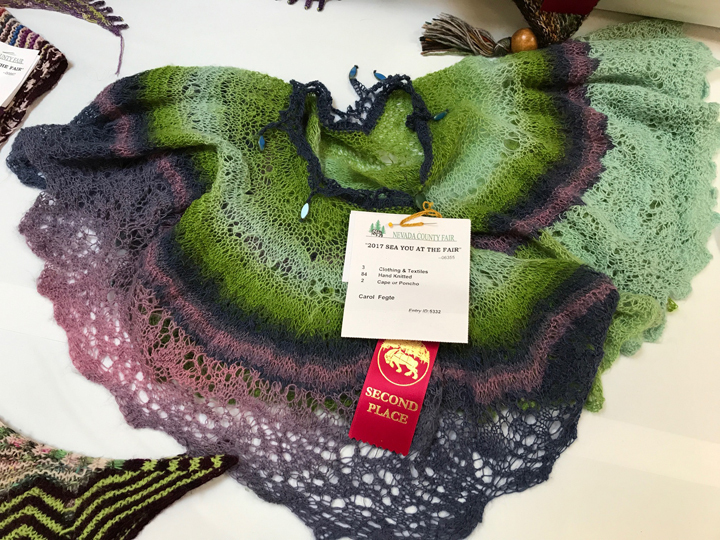 My friend Jo Ward’s quilt-like shawl made in mohair. Kaffe would love seeing this, . . . and I would love wearing it. On to the quilts. Trish Morris-Plise will be at the retreat this year. (And haven’t you come every year, Trish?) 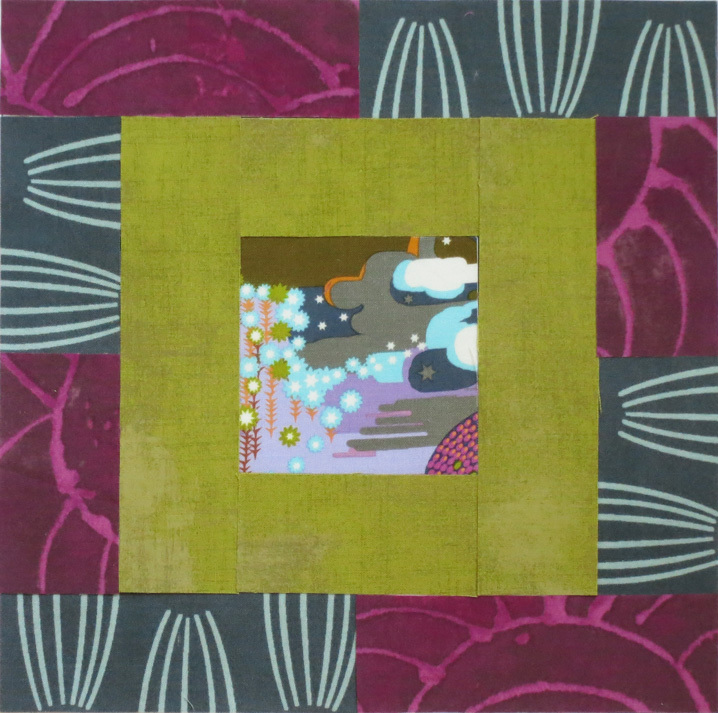 Her work is amazing and eclectic, from art quilts to this Hawaiian-style appliqué wall hanging. 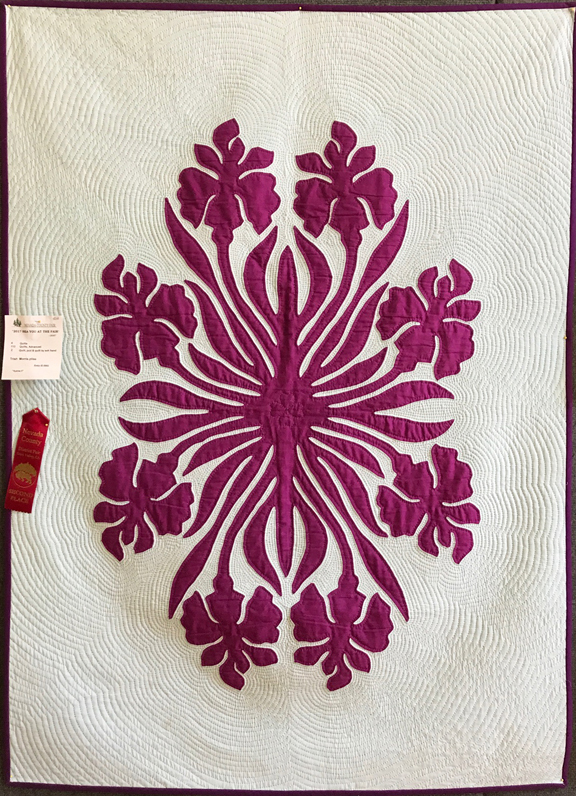 What wonderful hand quilting! In Lorna Straka’s blue-ribbon bargello quilt (machine quilted by Susie Hardy) the center of the quilt advances because the batiks are more intense than the Kaffe Fassett border. Great fabric choices, Lorna! I never get tired of batiks. Their variations and nuanced colors make them special. 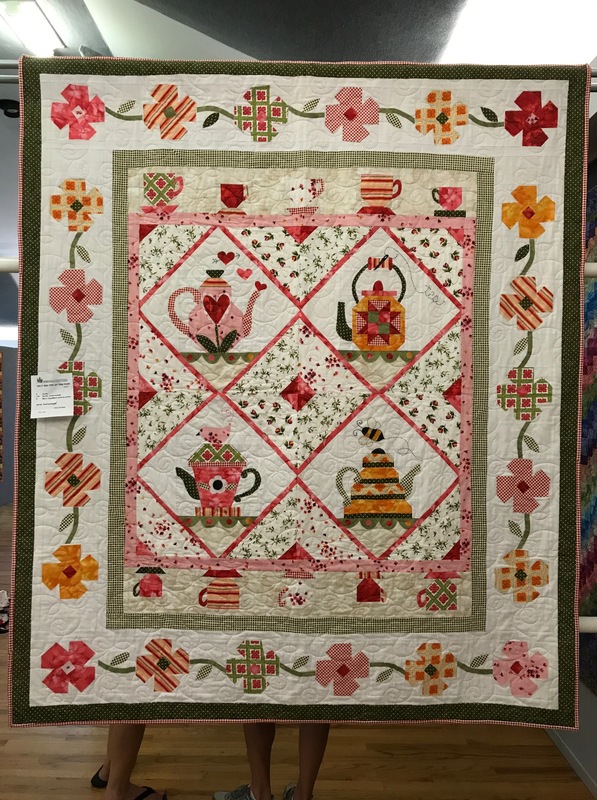 This charming quilt by Janet Hannameyer is the kind of quilt I love to see at the fair every year. 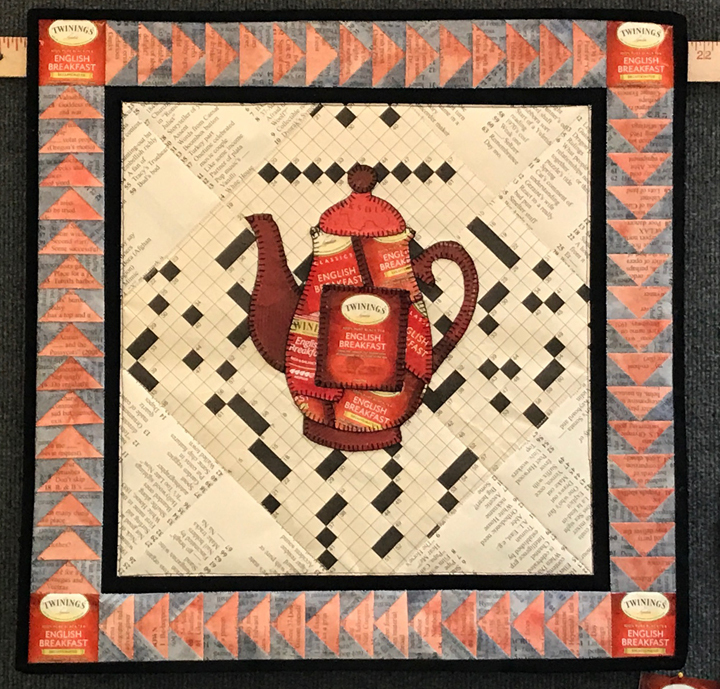 Another teapot quilt, by Deirdre Campbell, only it’s made of paper. Yes, paper! There’s batting in between, although she said her paper quilt last year had paper for batting, too. “A quilt has three layers. . . .” Notice the ruler that serves as the hanging rod. What fun. 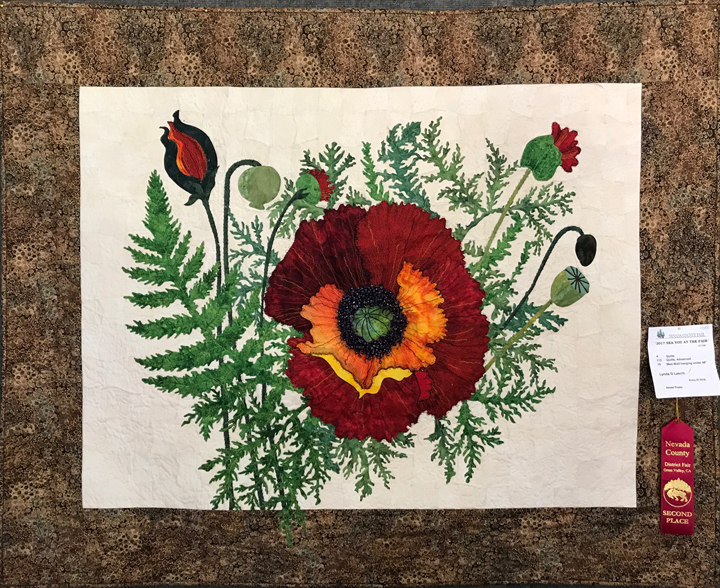 Lynda Lasich’s poppy quilt is a gem. You had to be there to appreciate the intricate shapes and thread painting. p.s. You saw it in various stages, but here’s the finished top for one of the retreat projects, “Best Friends.” I hope you agree that I deserve extra credit for using three different dots and one very low-volume stripe. See you soon . . . .
Gardeners pore over seed catalogs, and fashionistas wait eagerly for the Fall fashion issue of Vogue. Me? I pull out my big book of 501 block patterns because, as you may have noticed, I adore traditional blocks made in today’s fabrics. I also look for opportunities to simplify a block to make it more modern. That’s my idea of a relaxing afternoon—looking at block designs and playing with fabric. 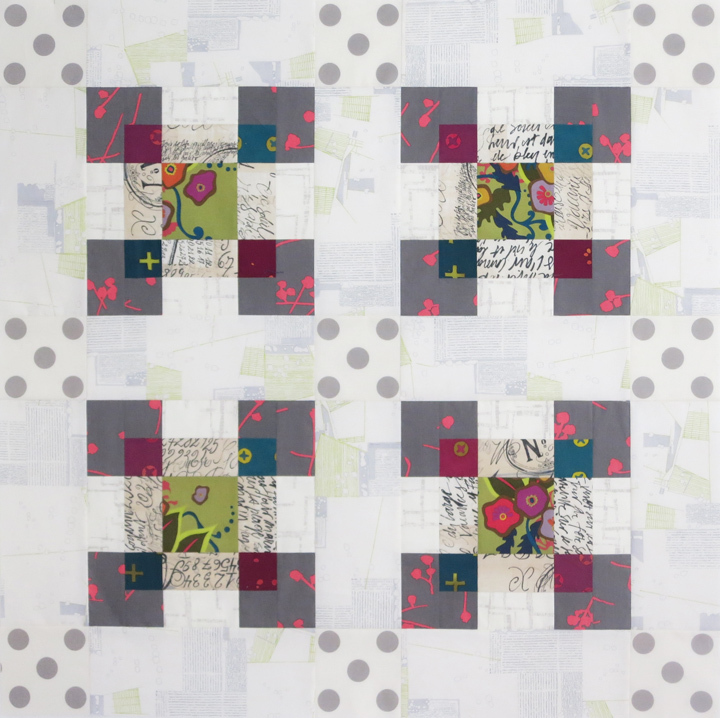 When my good buddy Heidi (I believe you know her) gave me a half-yard of this fabulous Anna Maria Horner print called “Fibs and Fables,” I thought it would be fun to do a three-block series, with each block having a different-size center square. I chose “The Crayon Box” for my first mock-block. 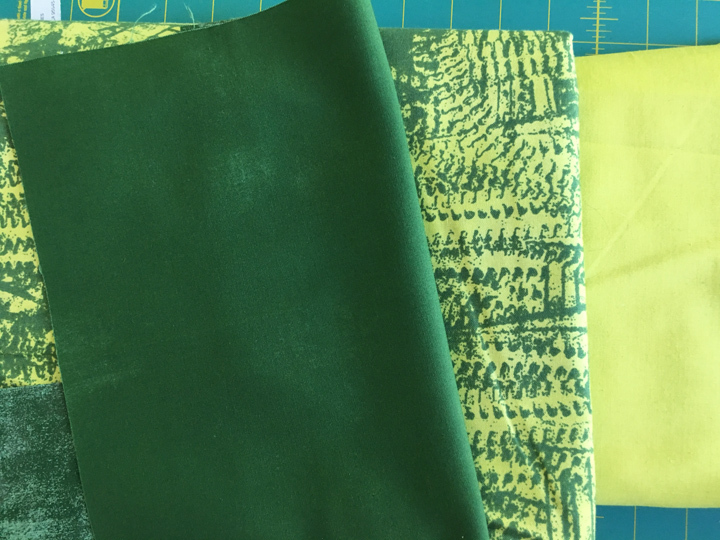 My supporting fabrics—a red-violet Marcia Derse, a yellow-green Grunge, and a slate-blue/gray by Parson Gray. I tossed in a low-volume background fabric, “Rush Hour” by studio e fabrics. (it’s a bit difficult to see, but it’s under the yellow-green square.) I challenged myself to use the same supporting fabrics in each block. With a center that’s only 3 x 3 inches (the block finishes to 9 x 9), you don’t see much of the AMH fabric. The supporting fabrics seemed to overwhelm the print and confine it. I started to deconstruct the mock-block (one of the benefits of gluing over sewing!) and really liked the simplicity—an example of “less is more,” I thought. How about using fewer pieces of the magenta and yellow-green, with a low-volume background fabric to open up the design? The simplified version is airier, with the possibility of rotating blocks to create an original quilt plan. Returning to my original idea of varying the proportions of the fabrics, I brought out one of my favorite blocks, “Cypress.” This block is also 9 x 9, but the center is 4½ inches, or half the width of the block and 50 percent larger than the center of The Crayon Box. I love seeing more of the AMH print. You also see more of the magenta print, but less of the yellow-green and slate-blue/gray. The Rush Hour background keeps everything light and airy. 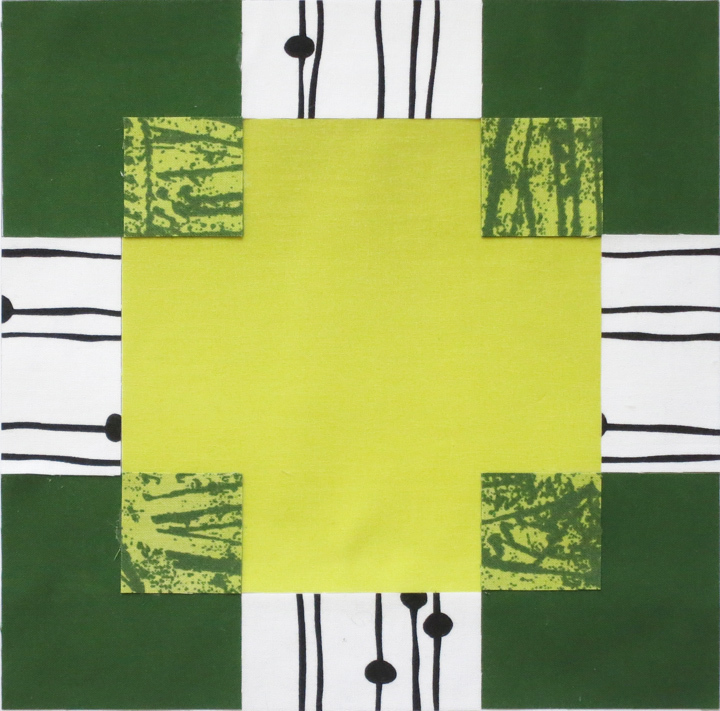 Next up, the block “Counterpane.” This version is 10 x 10 inches, with a 6-inch center that reveals even more of the print. Blocks like Counterpane are perfect for showcasing gorgeous, splashy prints, while the small triangles make effective accents. 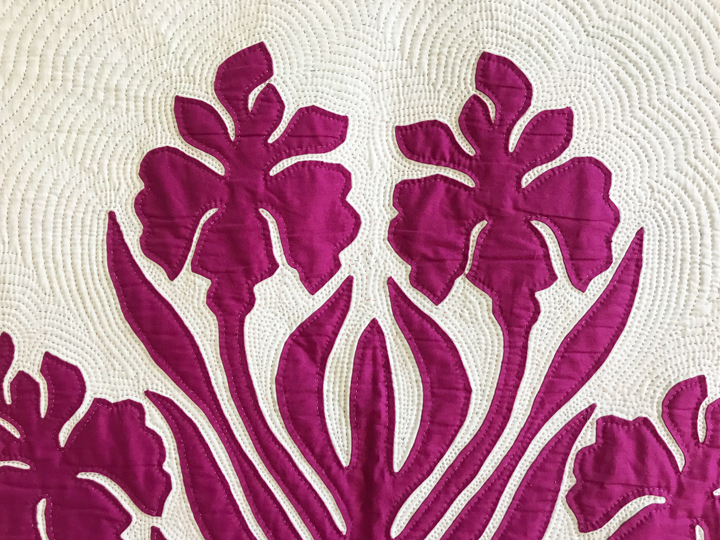 So now you know what I do on hot summer afternoons—I “play with my blocks.” And, no surprise, some of them actually turn into quilts, like the two new projects for my Zephyr workshop. Hoping you are staying cool. And for those of you coming to my Zephyr workshop, I hope you’re having fun poring over your stash and deciding which fabrics you want to play with! p.s. To my students, I’ll be in touch! I’m home from my teaching travels, and after so many weeks on the road, my own bed never felt so good. (Naples was wonderful—thank you Judy and Linda! I’ll write about it in my next post.) I’ve been working away on the project quilts for the retreat. One of them is based a block that is so versatile that I just had to try it with transparency. The block is known as “Antique Modern,” which seems a bit of an oxymoron. And here’s my quilt top, which I’ve named “Aerial,” after the name of the sashing fabric. If you don’t follow my newsletter, you can click here to see the April issue and read the story behind choosing the fabrics. Every time I looked at the block, I thought, “I wonder if . . . .” So yesterday I took a quick detour from my “Crazy Anne” quilt for the retreat to play with the design. That was fun, like reading a few chapters in a novel when you should be studying for finals. Next week it’s back to my retreat projects and full speed ahead on Zephyr. As always, thanks for looking and reading. I hope your summer is off to a great start—and that it includes a little color play with fabric you love!